We're spotlighting some of our BBC employees from around the country– including military veterans and spouses– in recognition of NAA's RPM Careers Month! 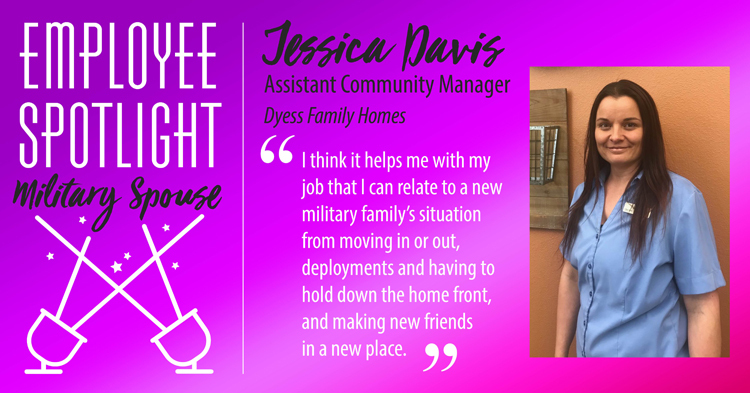 Continue reading to learn more about Jessica, assistant community manager. How many years have you been a military spouse? I have been a military spouse for 13 years. What made you decide to enter in the military-area for your career? Living on the base already with my spouse, working in another capacity for the military was a short commute and I knew I would learn a lot more about the military. How long have you worked for BBC? 4 years this August. What do you enjoy most about your job and working with military families? I enjoy a lot about my job, but my favorite is the excitement of the military family getting a new home. I think it helps me with my job that I can relate to their situation from moving in or out, TDY, deployments, holding down the home front, and making new friends in a new place.